We are pleased to welcome you to our kennel. English Bulldog - the most wonderful and amazing dog breed. Bulldog first appeared in our house in 1992. In 1993 we released our first litter with the prefix Dancing Queen, registered in RKF. 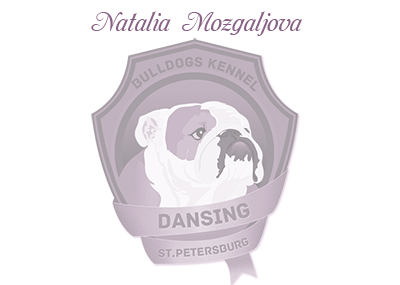 In 2003, the kennel was registered Dancing in FCI. We consolidated the blood in the kennel of many famous nurseries in England and Europe, such as OCOBO, MYSTYLE, BRITISHPRIDE, WENCAR, ICEGLINT, BLEJENHOEK. Our breeding dogs have a stable mind, perfect anatomical addition and good health, as evidenced by the longevity of our pets. Dogs Kennel stably are successfully exposed at shows of the highest rank. 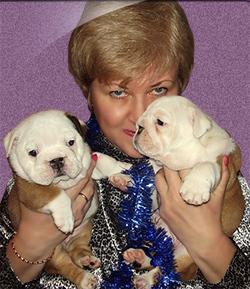 They are used extensively in many professional breeding kennels, both Russian and foreign. Owning a puppy purchased in our kennel, we provide comprehensive assistance and are confident that, as we do, they will love this truly amazing and wonderful breed. We hope that visiting our website will be for you an interesting and useful.